Even though they call us stalkers here at ILoveTaB, we have to agree – Stock TaB! As I prepare to crack open the last soda I brought back from Nevada this summer, I have to ask: Why is TaB so hard to find? I still remember when TaB was hugely popular, you could even get it in 2-liter bottles and find it in Coke machines. 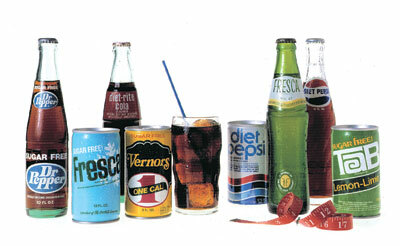 However, I guess when diet Coke really took a hold in the late eighties, people preferred it. I don’t know if people liked the way it tasted better, if they followed the brand they could trust, or if it had anything to do with the infamous saccharin studies. In case you are unaware, those studies charged that saccharin caused cancer in laboratory animals. What they didn’t tell you was that the dose of saccharin they were administering to those rats would have killed anything. Kind of follows that old adage that too much of anything is bad. I also seem to remember that when Nutra-Sweet burst onto the scene as a replacement for that evil saccharin, all the sodas jumped right away… with the exceptions of TaB and the diet Shasta sodas. I think the grocery/generic brands also took their time making the switch. Looking at the side of the TaB can on my desk, they did eventually change their formula at some point, for it now has a mix of saccharin and aspartame. All I know is it’s tasty. And, once that last can is gone, I won’t be getting any for a while. So, does TaB have a fan following? Is it enough to get a midwest bottler to start distributing it again? Do former fans of TaB even remember it? Clearly, TaB does have a following… because a few fans have a long standing website at iLoveTaB.com, which is your basic stalker site… only their stalking appearances of a canned beverage insted of some celebutante. All I know is I’d love to find some regular supply of TaB. Perhaps I should ask my baby sister in Portland to bring me a six-pack next time she travels this way. She’ll probably think I’m crazy, but you never know ’til you ask! Very,very sad news from Iceland – Vifilfell – maker of TAB, Coca Cola and other products in Iceland will stop production of TAB this spring. The last batch og 2L TAB is currently in stores but one batch of 1/2L TAB is yet to be produced and will probably sell out by this spring. TAB was introduced to the Icelandic market in 1982 and has been widely available through the country ever since. It came out of a Brooklyn hospital and in very few years changed not only what Americans drink but how they see themselves. It is probably fair to say that hyman kirsch, 50 years dead, his once powerful beverage company now a shadow of its former fizzy self, could not have imagined the ways in which his No-Cal soda would change the world. Kirsch was gone before Diet Coke hit supermarket shelves everywhere; he never heard â€œTab, Tab cola, for beautiful peopleâ€� or drank a diet soda â€œjust for the taste of it.â€� But his legacy is a multibillion-dollar-a-year business and has created a nation full of consumers thirsty for the latest liquid nothing.